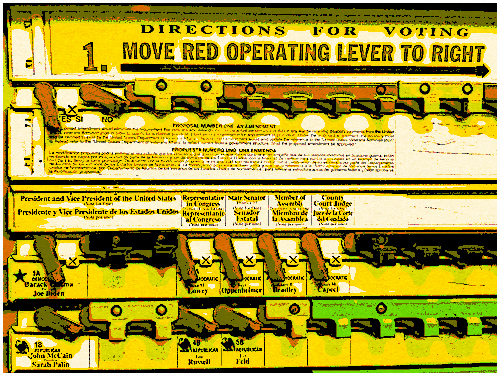 American voting machine. Original Photo: John C. Abell, via flickr, licensed under Creative Commons. Recently, I attended Shirley Reushle’s keynote presentation at the recent annual conference of the Australasian Professional Legal Education Council (APLEC) in Auckland (you can read my post about this here). Shirley is with the Australian Digital Futures Institute at the University of Southern Queensland and spoke to the theme, spoke to the theme of ‘Learning Community: If I Build It, Will They Come?’. Near the end of the presentation, Shirley used the Poll Everywhere app, asking the audience to tweet or text their comments and ideas about the pros and cons of online learning communities. The audience comments were anonymously displayed on a web page using the presentation screen. Poll Everywhere provides a description of how the app works, here. Essentially, you use the app’s “poll creator” to set up the question. Different categories of questions are available, including free response, fixed choice, and multiple choice questions. The app provides a numerical code that you distribute to the participants, who can vote using SMS text, Twitter, or a web page. Votes via Twitter require a Twitter account. The results are displayed in real time via a web page (can be embedded in your own web page) or via your presentation software. You can try it for free for up to 40 responses – there are pricing plans for non-profits and business. There will be similar apps out there, so it is worth looking around to find one that suits your needs. For example, the Edudemic site provides a list of ’45 powerful tools to create polls and quizzes’. I thought Shirley’s use of the polling app worked really well in the presentation – several audience comments were displayed and prompted discussion – it energised the presentation and drew out fresh insights. I am thinking about using this in the future. This entry was posted in apps, conferences, online discussions and tagged apps, interactions, learning community, polling, presentations, SMS, Twitter. Bookmark the permalink.